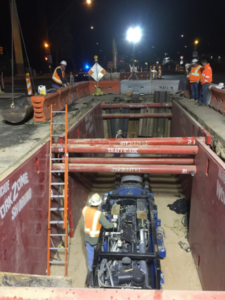 22nd Street Sewer Augmentation - KE&G Construction, Inc. This project consists of the augmentation of approximately 1 mile of wastewater lines. The selected stretch to be augmented is along 22nd Street from Alvernon Way, downstream end, to Swan Rd, upstream end. The existing sewer line is 10 inches in diameter vitrified clay pipe (VCP) between Alvernon Way and Swan Rd. This project received the 2016 APWA SAB Public Works Award Project of the Year Environmental Less than $5 Million.